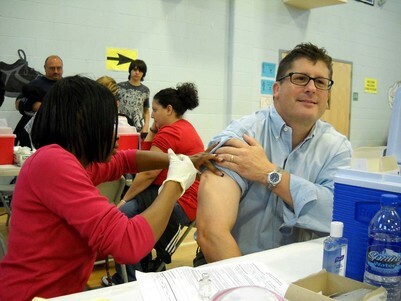 An annual flu vaccine is the first and best way to protect you and your family from the flu. People should be vaccinated before flu activity begins. The Centers for Disease Control (CDC) recommends that people get vaccinated by the end of October, if possible. The Monmouth County Health Department (MCHD) offers convenient flu shot clinics. Cost is $25.00 and several insurance plans are accepted. Call 732-431-7456, ext. 8512 for more information. Oct. 26 from 9 a.m.- noon at the Neptune Senior Center, 1607 Corlies Ave. Cost is $25; insurance also accepted. Oct. 26 from 9:30-11 a.m. at the Villages in Howell, Rt.9 & Wyckoff Rd. (Free to Howell Residents only, must be 60+ years, not open to insurance). Oct. 26 from 1-3 p.m.at Surrey Downs Club House, Howell, 1 Queen Anne Blvd. (Free to Howell Residents only, must be 60+ years, not open to insurance). Oct. 28 from 10 a.m.-noon at the Asbury Park Senior Center, 1201 Springwood Ave. Cost is $25; insurance also accepted. Nov. 2 from 11 a.m.-noon at the Neptune City Community Center, 117 Third Ave. Cost is $25; insurance also accepted. Nov 3 from 12:30-1:30 p.m. at the Eatontown Borough Hall, 47 Broad Street. Cost is $25; insurance also accepted. Check the MCHD Calendar of Events for updated events and added clinics. Flu is a contagious respiratory disease that infects the nose, throat, and lungs. Sometimes people confuse the common cold for flu because they have similar symptoms. Colds are usually milder than flu. According to the CDC, can lead to serious complications including hospitalization or even death. Learn more. You can join the effort to fight the flu by getting your flu vaccine and encouraging people to protect themselves and their family by doing the same. Join the conversation online with the hashtag #FightFlu. Go to http://www.cdc.gov/flu/freeresources/print-general.htm for flyers, posters and more.